Follow your arrow! 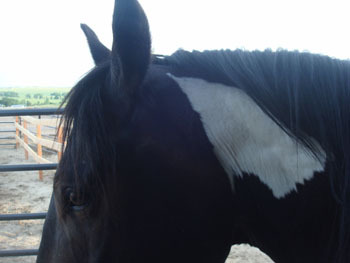 The pictured horse with the arrowhead is Spike, otherwise known as Kay’s Painted Buddy. It was he and his mother, Cocoa, that sparked Kay’s interest in learning how to make equines more comfortable in the work we ask of them. In the Equine Touch modality, one of the moves is described as an arrow for the way the practitioner places his/her hands on the horse’s body. Spike’s arrow is symbolic here! For five years Kay has been studying and practicing bodywork on horses, mules and donkeys, working her way through the levels of the Equine Touch Foundation. She absolutely loves it! Helping equines feel and move better is by far the most rewarding aspect of her equine life, better than any blue ribbon she has ever won! In addition to attending required classes for Equine Touch, each level requires written presentation of findings for a prerequisite number of equines the student has worked on; a written theory test; a written practical test; and an in-person test of the student’s skills in front of the examiner. In the final level, Kay has passed the written work (“outstanding”) and will be presenting her case studies in April, 2018. Upon passing the final, in-person session with an examiner, she will be certified as an Equine Touch Foundation practitioner. Kay will be featuring her Painted Buddy’s arrow on her business card! This below comes from the heart … We consider Ross and Kay to be "Donkey whisperers"! We adopted a herd of abandoned donkeys in Central Virginia during March 2013 after relocating to the USA from South Africa. They were for the most part wild and had to be sedated every time the vet or farrier was in attendance. That was until Ross and Kay agreed to meet the herd and work with them. We are of the opinion that what they achieved in three days with our 11 donkeys ranging from 1 year old to 35 years old was a miracle! It certainly changed our and the lives of our animals forever! Their professional and compassionate approach as well as their expertise surpassed all our expectations and we will forever be grateful to them! Hi! I’ve been taking lessons with Kay for 2 years. I don’t have my own horse,but I go trail riding several times a year with friends or at ranches, and know I needed to have a better foundation for staying in the saddle! Kay is extremely patient, offers great suggestions, and has absolutely helped me be a better rider. During our lessons, we focus on hand and leg movements, and being grounded in the saddle. We also work on using legs/weight as well as looking where you want to go instead being rein heavy. My lessons are the highlight of my week! Some days I’m ‘on’, and other days I’ve let stress get to me, but no matter, Kay always finds a way to help me connect with Spike. This has been a great stress reducer for me! The outdoor arena is wonderful, and we use poles and cones to make each week a different riding experience. The stable is very clean, and horses, donkeys, and burros are very well cared for and loved, which tells you everything you need to know about Kay and her husband Ross. Happy to answer any questions you may have. Kay and Ross Keller are a multi-talented team when it comes to equines. I first consulted them when I went from horses to mules and needed help understanding the mule mind. After agreeing that my mule and I had a bond worth preserving, they introduced me to their donkeys and explained how donkeys think and process relative to how horses do, allowing me to embrace a whole new aspect of my equine experience. After a serious horse wreck left me with multiple injuries, Kay also worked on restoring my confidence on my new mule, getting to know her and exploring what she did and did not know. Kays has released this mule from pain with her hands on bodywork, allowing my mule to make peace with a saddle and enjoy the trail, and we are happy to have Ross as our mule hoof expert. Kay and Ross both helped me evaluate another mule for sale, one with whom a bond did not come easily because of his tendency to withdraw and avoid human contact. They were both able to see the hidden potential in this scrawny, spooky, neglected mule and declared him worth the effort. He is now a beautifully muscled machine who carried me safely for 800 miles on the trails and mountains of Colorado last year. Most importantly, I find the Kellers to be consistent and reliable cheerleaders and my first stop for problem solving when my herd and I need support. I have had the pleasure to work with Kay Keller on a couple different sectors of horsemanship. Kay has performed body work on both of my horses which has shown to have a positive impact after each session. Both of my horses tend to get sore and stiff for unknown reasons and after each session of body work my horses are calm and noticeably more comfortable. I have also been able to attend a few private riding lessons with Kay and as a result my confidence as a rider has grown significantly. Kays soft and kind approach to both myself and my horses has been very comforting which has allowed for me to build a stronger relationship with my equine partners. I strongly would recommend Kay to anybody that has a desire to improve their horsemanship and/or have horses that can benefit from excellent body work.